Sir Isaac Newton is better known for the study of Gravity and Calculus, but Newton’s Colour Wheel is one of the major reasons we now understand why and how colour works. Newton’s work with white light led him to the discovery of the visible spectrum. He observed the way light would separate and appear to bend as it passed through a prism. The fact that every child knows the colours of the rainbow, red, orange, yellow, green, blue, indigo and violet, is the result of Newton’s discovery. 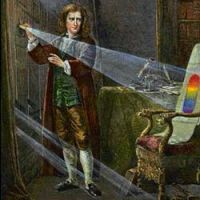 In his original colour wheel in 1704, Sir Isaac Newton included musical correlations and notes, but the experiments also led to the theory that red, yellow and blue were the primary colours from which all other colours were derived. Whilst that was not entirely accurate, this theory was influential in the development of later colour wheels, including the ones used today. The value of Newton’s Colour Wheel can hardly be overstated in the development of colour systems like Pantone, Munsell and RAL, that give designers the colour tools to create appealing palettes and designs by applying the underlying science of colour.